Parties to the United Nations Framework Convention on Climate Change (UNFCCC) agreed to submit intended nationally determined contributions (INDCs) in the run-up to the 21st Conference of the Parties (COP21) in Paris. INDCs outlined the Parties’ contributions towards reducing greenhouse gas emissions. Moreover, several INDCs also included adaptation. By 2017, a total of 192 countries had submitted INDCs to the UNFCCC. 145 INDCs included adaptation and 55 INDCs specifically referred to the NAP process (see Tool for Assessing Adaptation in the NDCs (TAAN)). Unless countries chose to amend their INDCs prior to ratifying the Paris Agreement, these documents became their first nationally determined contributions (NDCs). As of 29 August 2017, 154 NDCs have been submitted of which 115 include adaptation. The term (I)NDC is used to refer to both INDCs and NDCs. Why link NAP processes and NDCs? The NAP process can inform possible future iterations of the NDC adaptation goals as well as ‘how’ NDC adaptation goals are implemented. NDC adaptation components raise the profile of and increase political support for adaptation. Linking the NAP process with possible future iterations of NDCs can support the identification of adaptation-mitigation co-benefits. Establishing coherent governance structures at the national level by linking NAP processes and NDCs can help to avoid duplication of efforts and make efficient use of limited resources. Linking the NAP process with NDC implementation facilitates access to finance for adaptation. How can NAP processes and NDCs be linked? Linking NAP processes and NDCs has implications for national climate change policy governance and coordination. It enables streamlining of a country’s transparency framework and can support the preparation of adaptation-related reporting, such as national communications, to the UNFCCC. As an iterative approach, the NAP process can be tailored to specific national circumstances and can support the implementation and possible future iterations of adaptation goals. 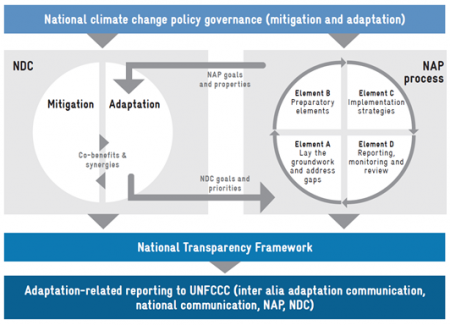 The four elements of the NAP process, as shown above, can be reflected in the implementation and possible future iterations of NDC adaptation goals. For example, this could ensure that groundwork for the NAP process (Element A) takes due account of the NDC goals and priorities. It could also mean that preparatory elements of the NAP process (Element B); for instance goals and priorities identified through the NAP process could inform adaptation related content in the NDCs. Moreover, arising adaptation mitigation co-benefits and synergies could also be a means of supporting a more strategic and effective approach to accessing and mobilizing climate finance for the implementation of NDC and the NAP process. More information on the NAP process is also available under Mainstreaming & NAP and at NAP Global Network. Further information on NDCs can be found at the NDC Partnership. NAP & NDC "at a glance"